Narendra Modi, India’s most successful politician is also the top fashionista of Indian politics. He knows the rules of political dressing. There are three rules of political dressing. Firstly, you must dress well. If you are well-dressed you give the impression that you are in control of your life. How are people going to trust you with the job of running the country if they think you are not in control of your own life? Secondly, you must dress differently. How will you stand out from the crowd if you wear the same starched white kurta-pyjama every politician wears? If you don’t stand out from others, how will you get noticed? Thirdly, you must wear the same dress every day, as far as possible. Dressing the same way all the time makes you come across as consistent. When you are consistent, people know what to expect from you. Consistency builds trust. Narendra Modi, India’s most successful politician, is also the top fashionista of Indian politics. He knows these rules. Do you remember seeing Narendra Modi in the standard white kurta-pyjama of Indian politics? He mostly wears coloured kurtas with white churidars. As Gujarat chief minister, he patented the half-sleeved kurta. Dress is used to help project the image you want of yourself. Ranveer Singh often dresses like a clown because he wants to project a cool-guy image. Salman Khan dresses in tight t-shirts to maintain his bad-boy image. Your dress is who you are. Modi’s half-sleeved kurta gave the impression of a man who isn’t wasting time rolling up his sleeves. His sleeves are always rolled up, he’s always on the job being a good administrator. 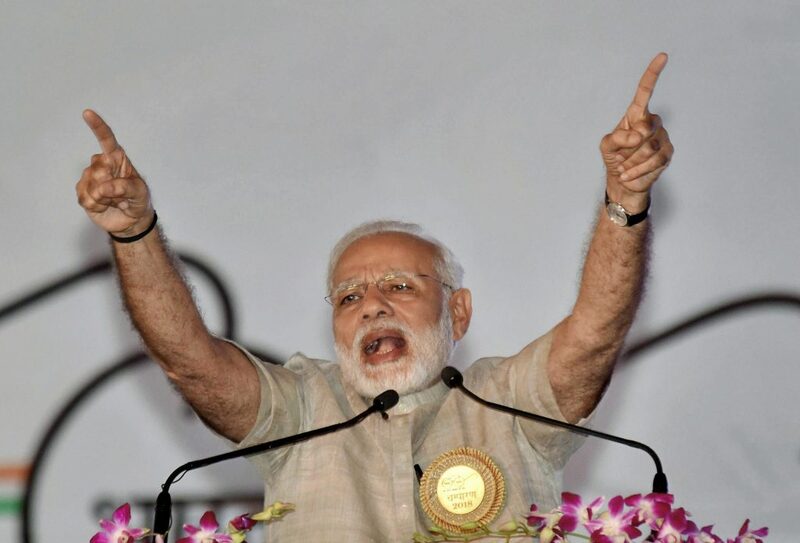 As Modi changed over to become Prime Minister, he changed his dressing to a more formal one: Crisp full-sleeved kurtas, churidar pyjamas and colourful Nehru jackets. This dress makes him look stately, going with the role of a Prime Minister. In this visual age, people’s awareness of a politician is through him talking, walking, sitting. On smartphones, TV screens, newspapers and hoardings — your clothes are leaving a deep, subconscious impression on the minds of voters. Like the late Steve Jobs, it helps Mark Zuckerberg leave an indelible impression in public memory that he wears the same dress every day: Grey, half-sleeved shirt and blue jeans. Mamata Banerjee’s sarees don’t look chic like Sonia Gandhi’s, but she always wears white sarees with mono-coloured borders. The way she carries the simple white saree, she gives off the impression of the austere, agitational, people’s leader too busy fighting for the masses to appear formal. 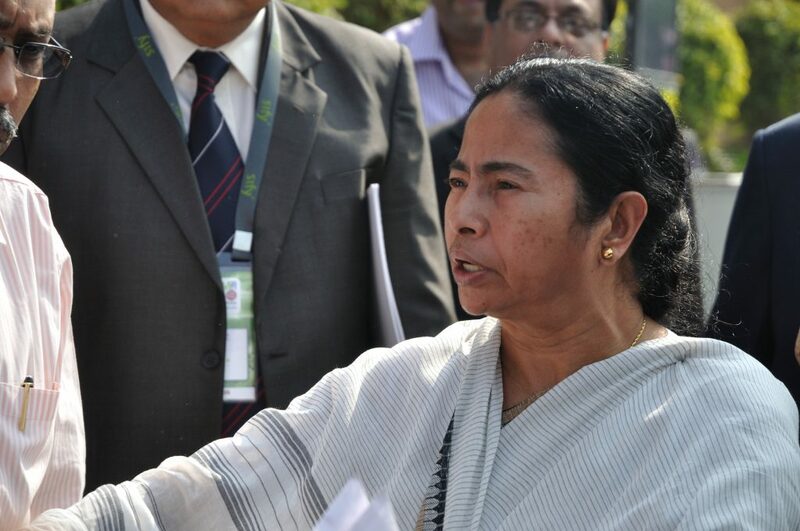 Custom-made by weavers in Hooghly, the Dhanikhali saree Mamata Banerjee wears is now being sold as a brand, the Mamata sareee. It is the consistency of dressing style that begets a kurta the nomenclature Modi kurta, and helps Modi appropriate the Nehru jacket as the Modi jacket. The appropriation is also a visual assertion of ambition: Modi wants to replace Nehru as the leader who shaped the nation. In the early 1990s, Mayawati had her ponytail cut because she wanted to project an ‘iron lady’ image in a world where being a woman, being feminine, was a disadvantage. Her rich-looking fawn or pink suits and expensive handbags help her project the image of a Dalit queen; austerity is for the upper caste politicians trying to appear poor. As a politician, Arvind Kejriwal continued to dress the way he did as an NGO-wallah. His unaesthetic floaters, worn-out colourful socks in the winter, are a style statement of their own, projecting an agitational, urban street-fighter image. 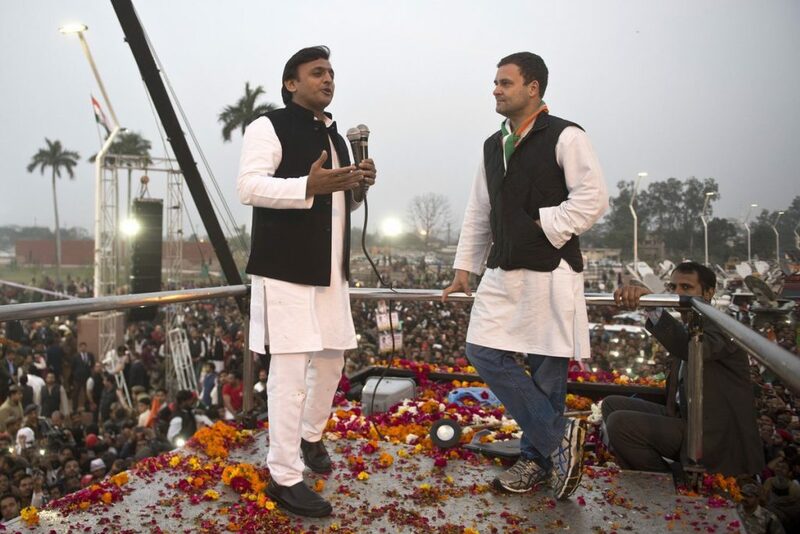 Akhilesh Yadav wears the best quality black Nehru jackets, white trousers that don’t look like crumpled pyjamas, and always carries at least two red-coloured Gandhi topis. Just in case one gets lost — that is how critical the red topi is to his style statement. Few colours ever stand out as red does. Given that regulation white kurta-pyjama is the Indian neta dress, it doesn’t take much to stand out. K.C.R. Rao, creator and chief minister of Telangana, wears white shirts, white khadi trousers. In contrast to the lazy kurta, his crisp collars make him look like a man of resolve. He’s been buying the cloth and getting it stitched from the same shop in Hyderabad since 1960. That’s nearly six decades of being consistent. In 2016, he went there and ordered 100 pairs of the same dress! Jawaharlal Nehru trademarked the black jacket over the white kurta-pyjama. According to K. Natwar Singh, Nehru used to call it the “Congress livery”. It is difficult to think of Indira Gandhi without her sarees, and how she covered her head with the pallu while addressing rallies. Jinnah is remembered for his distinct topi, Gandhi for his loin cloth, and Ambedkar’s blue suit was so iconic that Kanshi Ram chose blue as the colour of the Bahujan Samaj Party. Lalu Yadav’s lota hairstyle, hair coming out of his ears like wild grass, is in keeping with his history of a subaltern leader who gives Yadavs dignity and opportunity. He still looks like he could be a doodhwaala in a Bihar village. There is nothing distinct about Rahul Gandhi’s white kurta-pyjamas. What’s worse is that he seems to be uncomfortable in them. He’s seen rolling up his sleeves while saying “dekho bhaiyya” in an urbane accent. The sleeves fall again and again, and he has to roll them back several times during a rally speech. Can a man who can’t manage his sleeves manage the country or even a party? The white kurta-pyjama could work if he was serious about the Congress livery. He could appropriate it with pride, signalling an assertion that he’s proud of the legacy he inherits. But how do sports shoes go with the kurta-pyjama? Those casual black jackets he wears over the kurta in the winter are the opposite of the Nehru jacket in looking sophisticated, classy and formal. That jacket just doesn’t go with the kurta-pyjama. He fails on the consistency test, too. Often Rahul Gandhi is seen in a t-shirt and blue jeans. On his US trip last year, he was even seen wearing loose-fitting jeans that are so outdated they’re called “dad jeans”. Not even middle-aged men wear them these days. Forget clothes, Rahul Gandhi can’t even maintain consistency on his face. Some days he’s clean-shaven, some days there’s a stubble, and sometimes a salt-and-pepper beard that makes you wonder if he’s going through a Devdas phase. With these inconsistencies in Rahul Gandhi’s appearances, he comes across as a man who couldn’t care less about dressing — which is how many people want to be, but you can’t do that in public life. People don’t know if you are a typical old-style Congress politician or a youth leader, a chocolate boy figuring out life, or a man going through mid-life crisis. Dress also needs variation: After all, Modi sometimes wears stately bandhgalas on foreign trips. 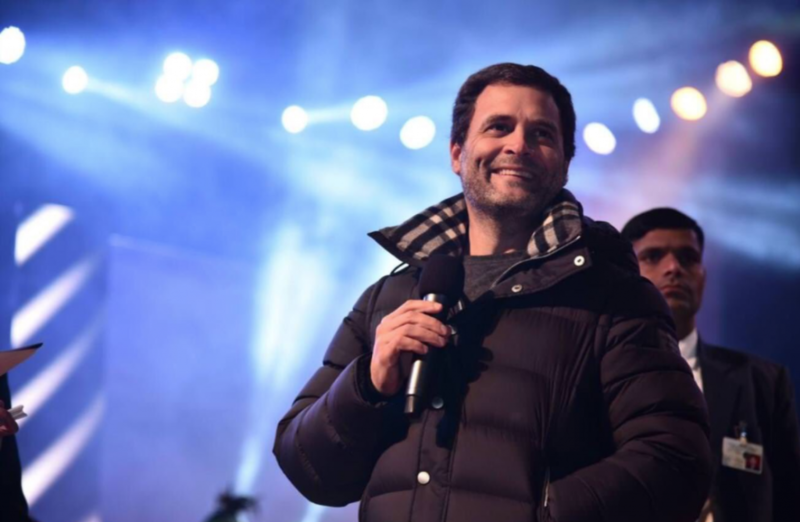 Similarly, Rahul Gandhi might argue that the youthful Shillong audience needed to see him in jeans and t-shirt and it was cold enough to need that jacket. Modi’s bandhgalas are the exception that only serve the rule. 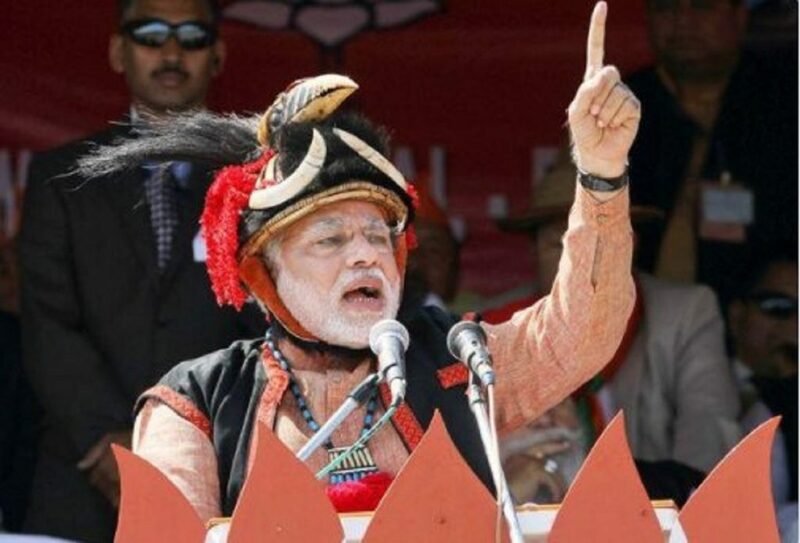 Modi mostly does not change his attire, only adds a headgear for the occasion. When the Himachal elections are nigh, he wears a Himachali topi on an Israel trip. On Independence Day, he wears a safa like a village elder, the pradhan, the head of the family. It communicates leadership; it tells you the man is in charge. A fan nearby blows the wind so that the edge of his safa flies in the air to maximise its visual impact. Wearing an expensive Burberry jacket here and showing off a phata kurta there confuses the voter. One doesn’t know who you really are — perhaps both those personas are lies. It makes him come across as inauthentic, and there’s nothing worse than that in public life. Even the phata kurta wasn’t convincing since he was wearing a jeans below. Authenticity is when you’re being yourself. The real Rahul Gandhi is the t-shirt-and-jeans guy. He should make that his uniform. The Congress livery is a discredited anachronism. The idea of the kurta-pyjama is a socialist one: You must appear to be an ordinary man of the masses. Today’s voter is aspirational. Today, it is not unusual to see young men in villages wear jeans and a t-shirt, camera phone in hand. 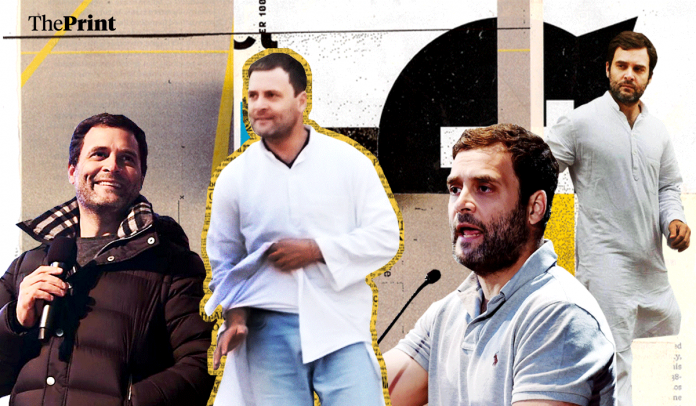 Rahul Gandhi might appeal more to such millennial voters — voters who are younger than his 47 years –— if he sticks to the clothes he’s clearly more comfortable in: Jeans and t-shirt. In the winter, the casual jackets he likes to wear will go more with this attire, as will his sports shoes. i dont think your article does make sense , if you notice rahul gandhi looks good and very cute in kurta pyajama than in t shirt and jeans , he looks very simple in kurta pyajama unlike mr 56 inch chesr person who wears expensive cloths . let people them selves decide what they shoud wear and what not.